While Democrats and the media are dragging Supreme Court nominee Judge Brett Kavanaugh for his admitted drinking “too much” at times in school, it should be remembered that two Justices appointed by Democrat President Bill Clinton and approved by a Democrat controlled Senate, Stephen Breyer (1994) and Ruth Bader Ginsburg (1993) have their own history of alcohol troubles. Justice Ginsburg, with Justice Breyer to her immediate left, ‘fell asleep’ after drinking wine before President Obama’s 2015 State of the Union address. Breyer’s Wikipedia page has no mention of his arrest for underage drinking. 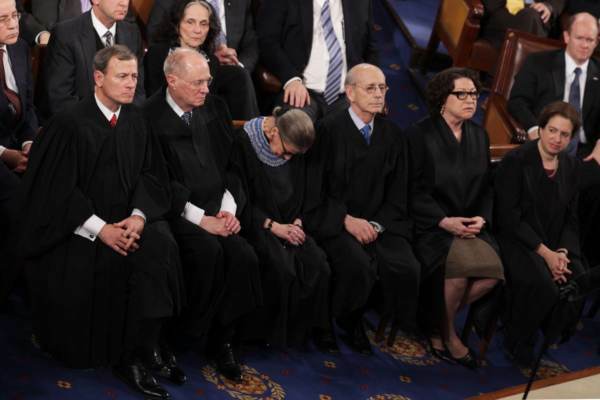 Justice Ginsburg, 85, spoke about ‘falling asleep’ at the State of the Union address by President Barack Obama in 2015 after drinking wine at dinner, brought by Justice Anthony Kennedy (! ), in a joint appearance with Justice Antonin Scalia that was ‘hosted by The Smithsonian Associates and moderated by NPR’s Nina Totenberg’ according to CNN. “The audience for the most part is awake because they are bobbing up and down and we sit there, stone faced,” she said. “But we’re not, at least I was not 100% sober,” she said to big applause. She blamed a fine wine Justice Kennedy had brought to dinner before hand. The post Democrat Supreme Court Drinkers? : Breyer Busted for Underage Drinking, Ginsburg ‘Not 100 Percent Sober’ at Obama State of the Union appeared first on The Gateway Pundit.